Click on the areas on the map to zoom in and locate the mountains. 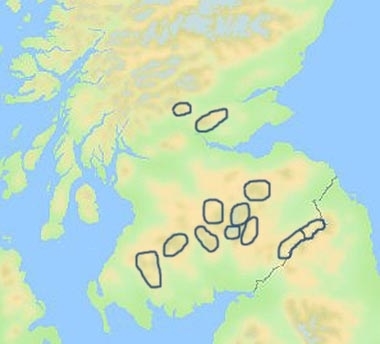 The Donalds are named after Percy Donald and his list of hills over 2000 feet in the Scottish Lowlands. They are based on a complicated formula for determining separate hills, and originally comprised 87 hills plus a number of other named "Tops". (Donalds appear as Class=D on this website, and Donald Tops as Class=DT). The New Donalds are an attempt to rationalize the qualifying criteria, being "hills in Central or Southern Scotland at least 2000 feet high (610m) with a drop of at least 30 metres (98 feet) all round". All New Donalds are either a Donald or a Donald Top, but some of the Donald Tops do not qualify as New Donalds. (New Donalds can be found by searching on Class=DN, though this does not appear in the Class column). Grateful acknowledgement to Percy Donald, and to the TACit Press for the New Donalds data.